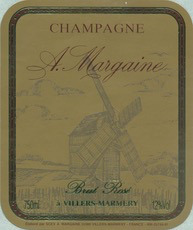 Sparkling A Margaine Champagne Brut Rose - Royal Wine Merchants - Happy to Offer! Arnaud Margaine took over this six and a half hectare estate from his father Bernard in 1989 and is the fourth generation of his family to work these vineyards in the Montagne de Reims. The estate was founded in the 1920s and was expanded by Bernard in the 1950s. In 1977 Bernard joined the Special Club and Arnaud has continued his father’s commitment to high quality champagnes and continues to improve his raw materials in the vineyard. The majority of Margaine’s holdings are in the village of Villers-Marmery, a 95% village for Chardonnay, and the parcels here are old averaging about 32 years. Margaine also has a small parcel of Pinot Noir in the village of Verzy. It's hard to find more charming pink Champagne.